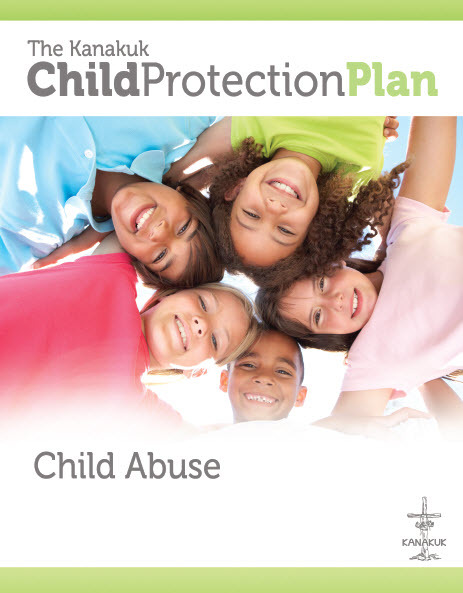 The Kanakuk Child Protection Plan (CPP) is a comprehensive protection system designed to prevent, detect or respond to child abuses in youth programming. The basis for these elements was influenced by experts in the area of child sexual abuse such as Praesidium, Federal Bureau of Investigation, Federal Justice Department, Centers for Disease Control, StopItNow, The Ashcroft Group, Darkness to Light, American Camp Association and others. The CPP is an ongoing work now in its 4th edition and continues to evolve as new information and tactics come available. In order to focus prevention efforts and resources, it is essential to clearly identify the perpetrator in terms of profile, characteristics, types and methods. "Therefore, youth serving organizations should develop abuse strategies based on the conclusion that child abusers are prevalent in our society, are virtually unscreenable and undetectable, are unlikely to be convicted or neutralized, and whose methods are more sophisticated than traditional prevention systems." 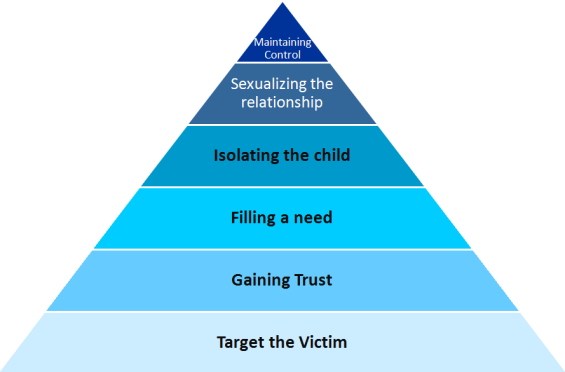 Primary Abuse Prevention (Thought Resolution): Stage one abuse prevention (see yellow shaded area) strives to provide an opt-out opportunity with remedial solutions to those in our society struggling with an inappropriate and illegal sexual attraction to children. This is true abuse prevention in that it solves the threat of abuse at the root level rather than reporting level. 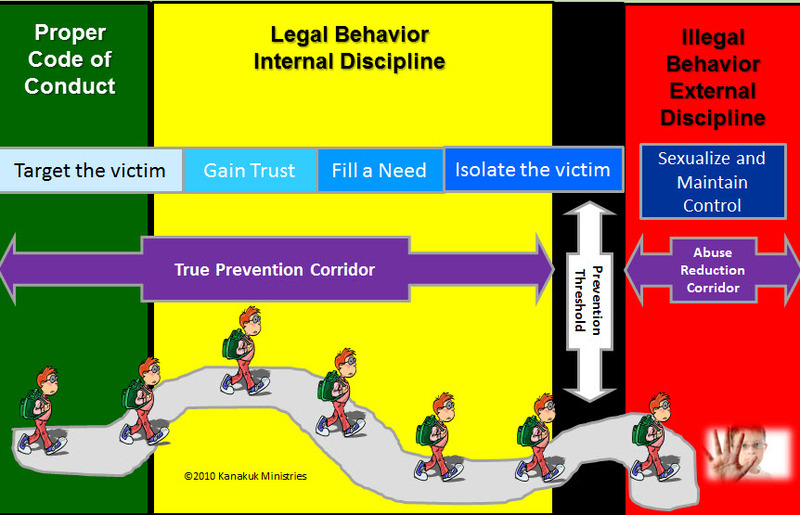 Secondary Abuse Prevention (Method Resolution): Stage two abuse prevention (see purple shaded area) combines the framework of stringent behavioral policies with effective bystander monitoring protocols to detect suspicious or inappropriate behavior or a breach in policies, then resolve prior to an occurrence of abuse. This is a deflectionary prevention outcome in that the threat may not be neutralized but rather deflected away from the youth serving organization still pursuing access elsewhere. Thus, the need for all youth serving organizations to collectively execute stringent plans. 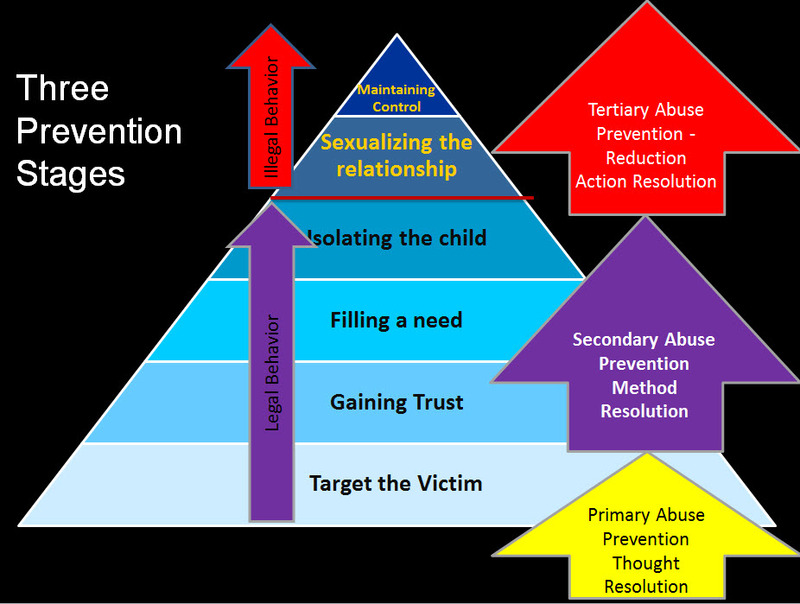 Tertiary Abuse Prevention/Reduction (Action Resolution): Stage three abuse prevention (see red shaded area) is regarded more as "reduction" than "prevention" in that it responds quickly to report to authorities in the event that inappropriate or suspicious behavior has occurred. While it serves to reduce or prevent more future or serious abuse scenarios internally, it may not neutralize the threat in the greater community due to a 3-5% conviction rate at the prosecution level. 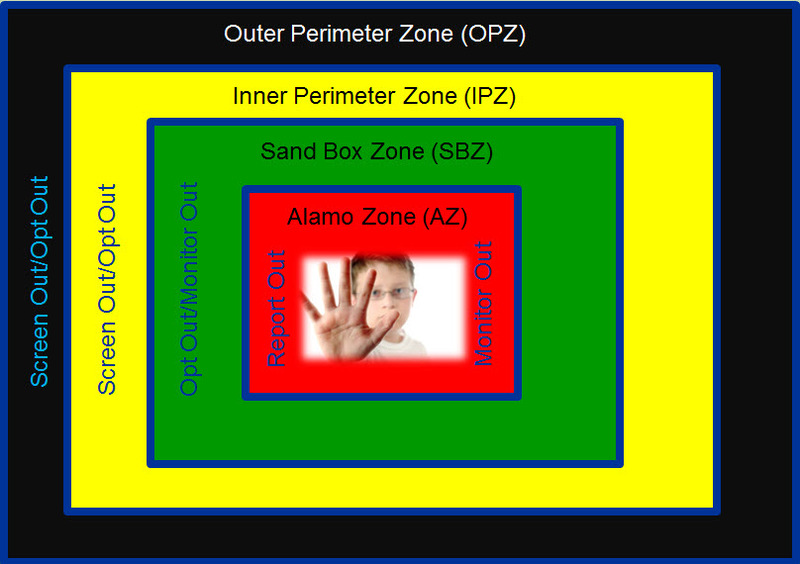 True Prevention Corridor: The True Prevention Corridor (TPC) denotes the span of time between peer/peer or adult/child appropriate interaction leading to illegal behavior. (See purple shaded area below). The TPC may span minutes, hours, days, weeks or even months, and is subject to the type of molester (see above), the method of grooming and boundary reduction, the vulnerability of victims, and the effectiveness of parental or organizational child protective measures. Green Region: The green region represents legal and acceptable behavior as defined by cultural expectations and/or program guidelines that comply with state laws and promote healthy outcomes. Yellow Region: The yellow region represents legal behavior, but may include suspicious, non-compliant, or inappropriate undertones or behavior patterns that are not illegal nor reportable according to state laws. Red Region: The red region represents illegal behavior as defined by state statute and is reportable and punishable by law. Prevention Threshold: The Prevention Threshold represents the boundary where adult-driven methods to prevent have failed, and potential victims must be equipped to recognize, resist and report inappropriate behavior. Abuse Reduction Corridor: The Abuse Reduction Corridor represents tactics to reduce the severity or frequency of abuse after an abuser has attempted to engage children inappropriately. Abusers may exhibit noticeable behavior actions on the green/yellow boundary in order to gain needed trust from bystanders and gatekeepers, and to exploit opportunities. The green/yellow regions represent the landscape whereby the first four stages of victim grooming are accomplished. Abusers may exhibit subtle, but perhaps noticeable, behavior actions on the yellow/red boundary to exploit weak protective measures, as well as groom potential victims in progression to stage 5 of the grooming cycle. In order to prevent child abuse scenarios, youth serving organizations, children and parents must collectively engage in effective strategies within the True Prevention Corridor. Screen Out - The remedy whereby a person is denied access to minors due to a negative background screen, reference, work verification, or red flag indicators. Opt Out - The remedy whereby a potential abuser opts out of working or volunteering at a youth organization, or from engaging minors inappropriately. Monitor Out - The remedy whereby a potential abuser is removed from access to minors resulting from suspicious behavior and/or inability to comply with organizational expectations or policies. Report Out - The remedy whereby an alleged abuser is reported by a third party or victim and is removed from access to minors and placed under legal investigation. 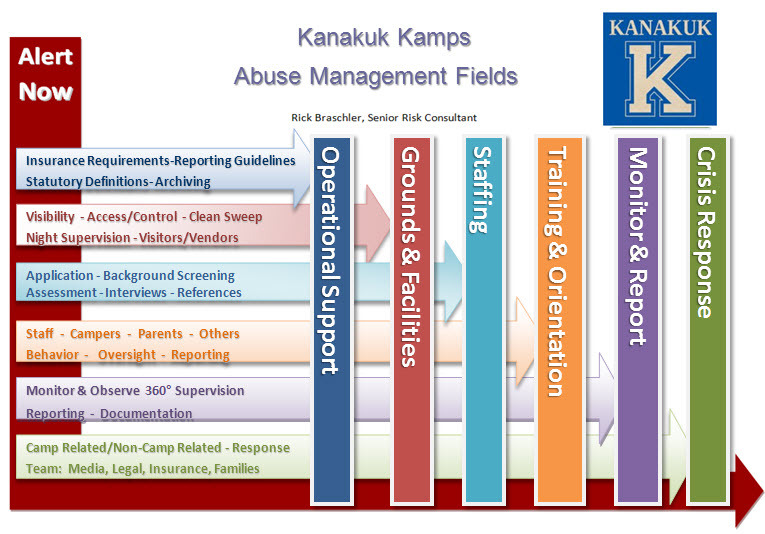 The Kanakuk Abuser Threat Indicator identifies positions or roles within a youth serving organization that may pose a greater threat to minors based on their degree of access and control. 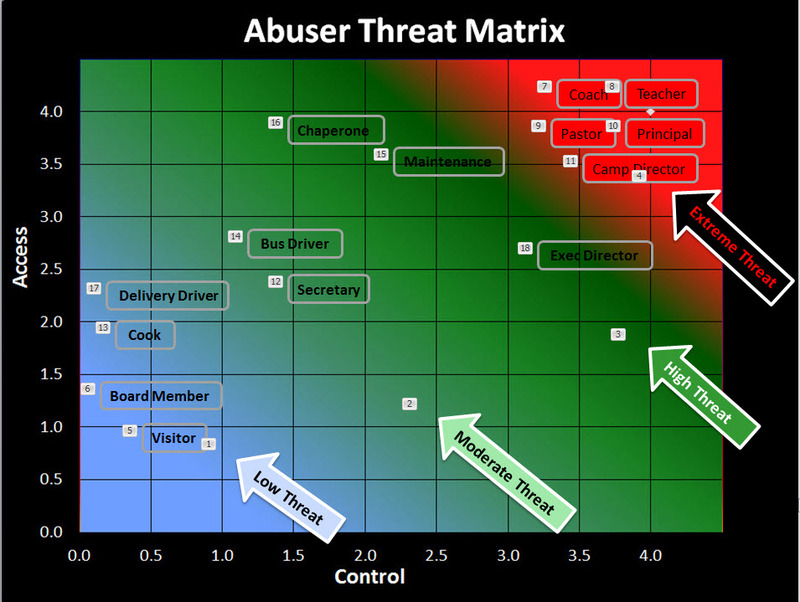 The greater the access or control of a position or role, the higher the Threat Level Score (TLS). The TLS score is derived from a series of eight questions based on degrees of access or control. Finally, based on the Threat Level Score, the youth organization can then focus resources on these higher threats as it relates to hiring, training and monitoring. EyeShot Theory training and inspection for the protection of visibility where private areas are mandatory (cabins, bathrooms), and the promotion of visibility where privacy is unnecessary (sheds, offices, meeting rooms, etc). 360 Supervision (3 W's) training to establish a sustainable method of monitoring human interaction to detect suspicious or inappropriate behavior prior to an occurrence of bullying or abuse. Non-Affiliated Personnel policies and procedures to regulate the access of visitors, vendors and contractors including the utilization of the Independent Service Provider (ISP) protocols. 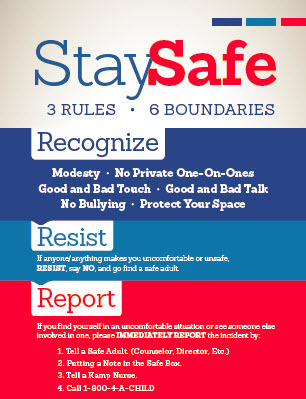 Youth 3-6-0 Safe & Secure training to equip all minors with age-appropriate knowledge to recognize appropriate boundaries, resist inappropriate behavior, and report uncomfortable or bullying scenarios. (3 Rules, 6 Boundaries, Zero Tolerance).